Perhaps. But let's change the story a bit. A settler is shot to death by a Palestinian gunman in Area A , which is under Palestinian sovereignty. Palestinian police investigating the event find that the settler had thrown rocks at the Palestinian, who defended himself and shot the settler – out of self-defense. Case is closed; the Palestinian shooter suffers no serious consequences. Would the settler's family be satisfied that a proper investigation had been carried out? Would they accept the word of the Palestinian police that justice had been done? Of course they wouldn't, and neither would the Israeli government. Because, as everybody knows, the Palestinian police have no jurisdiction over Israelis who are in Area A. Neither can they investigate, nor can Palestinian judges try Israelis. When a Palestinian kills an Israeli the Israeli security forces investigates and tries his case. When an Israeli kills a Palestinian, the Israeli police investigates and an Israeli court tries the case. In the above scenario, Israel would simply send it troops and apprehend or kill the wanted Palestinian. That is the fundamental inequity in all these stories. Only one side has the power; only one side controls the narrative; only one side investigates, tries, convicts, and sentences the other. When Israelis are injured, they have at their disposal police, army, and other security forces. When Palestinians are injured they have at their disposal the same police, army, and security forces , i.e., the Israeli one. Small wonder that Lt. Col. Omri Burberg, who was convicted for ordering a subordinate to shoot rubber bullets at a bound Palestinian protester in Ni'ilin, was "punished" today with the equivalent of a faint slap on the wrist, not even a potch on the tush. He will not be discharged from the army; he will not go to jail; he will not even be barred from promotion in the future (after a year or ). In a recent, and soon to be much-quoted article in the New York Review of Books, Robert Malley and Hussein Agha offer their typically dismal prognosis for an Israel-Palestine just peace. Their bottom line, literally, is "It won't get better anytime soon." In this setting, temptation has grown to increase international pressure on Israel and heighten its discomfort. If it is delegitimization Israelis fear, then it must be delegitimization that will make them budge. Faced with the prospect of isolation, Israel might be persuaded to end its occupation. But pressure is a double-edged sword requiring skillful handling, especially when exercised on a people convinced by the calamities of their own history of the inveterate hostility of much of the outside world. Those who wield it often only confirm in Israeli eyes how unreliable their avowed friendship was in the first place. One should not be surprised if the Israeli people, their sense of vulnerability enhanced, opt to hunker down rather than reach out. This paragraph assumes that there is a tactic or a strategy to increase international pressure on Israel in order to move it towards what the "delegitimizers" view is a just peace. Or to put it bluntly, supporters of the Palestinians have not been able to achieve their goals through the armed struggle, or through appeal to international law, or the UN. Now is the time to move against Israel and isolate it through a campaign of "delegitimization". Malley and Agha point out is that this may actually have a reverse effect; the Israelis will hunker down and will be less amenable to concessions and to reach out. This, I submit, is precisely the way Israel views "delegitimization," and I am surprised that Malley and Agha, hardly apologists for Israel, accept the Israeli (and pro-Israeli American) narrative at this point. For there is no such campaign. Neither the human rights organizations inside and outside Israel, or for that matter, the Boycott, Divestment, and Sanctions campaign against Israel, seek to delegitimize it in order to make it more amenable to a just peace deal with the Palestinians. In fact, "peace" is generally absent from those organizations' vocabulary. It's not about peace; it's certainly not about "delegitimization"; it's about calling attention to the bad behavior of a state and calling that state to conform its behavior to international norms. And such appeals happen all the time. Iran's human rights violations have elicited international criticism and even sanctions. The stated goals of this criticism and these sanctions have been to get Iran to behave as a state should behave. Similar international criticism has been made of Sudan, Saudi Arabia, Serbia – the list is long. Were the point of the international criticism of Israel's human rights record to put pressure on Israel to make concessions, then that pressure would be expected to recede when progress is made on the peace front. But, again, it's not about peace; it's about sanctioning those states that misbehave and cause people under its control to suffer. What the human rights NGOs do is publicize Israeli wrongdoing. They bring to the world's attention the deeds of the principal Israeli self-delegitimizers today: the Israeli Government, the Israeli Defense Forces, the Pro-Israeli lobby, the settlers, and everybody who is involved with the ongoing injustice against the Palestinians. When these organizations shine a light on Israel's dirty secrets, the result in Israel is not the phenomenon of Israelis hunkering down. I assure Messrs Malley and Agha, the hunkerers will always hunker, light or no light. The result instead is to split Israeli society into three uneven groups: those who always think that "the goyyim (except the Christian Zionists) are against us" no matter what; those who think that the criticism is justified; and those who are forced for the first time to look at themselves in the world's mirror, and who do not know how to react – but who feel very, very uncomfortable about the situation. To write otherwise about Israel is to sell Israeli society short. Israelis are hyper-sensitive to world criticism; they want and need the goyyim to love them; it is a validation of the Jewish state. When an Elvis Costello cancels his appearance in Tel Aviv, it makes front page news and is talked about for weeks. That, I think, is one of the virtues of Israeli society; it still cares about the world. And when the world treats it as a pariah state, it asks questions about itself – and debates about the wisdom of its policies. Israel, for the first sixty three years of its existence, has made remarkable achievements as a society, but those achievements have often come at the expense of the Palestinians, even those who are Israeli citizens. Without the spotlight of the world on them, consecutive Israeli governments created a Jewish state on the destruction of Palestine, through forced land sales, destruction of villages, legal and foundational discrimination against its non-Jewish citizens. For the first twenty years after 1967 it did the same on the West Bank with more destructiveness and greater impunity. Even with two intifadas, the situation has gotten worse. What is left for those who care about justice to do except to witness and to publicize? Justice may not be a value that trumps all other values, but it is a value that is in need of no other values for its own validation. I don't believe that the consequences for calling Israel to account will be as dire as Malley and Agha make it out to be; I think Israeli society is better than that. But until Israel learns that there is a price for its bad behavior, there is no hope for it to change it. At the moment, what Israel calls "delegitimization" and what I call "publicizing Israel's self-abuse" is the only hope for teaching an errant state a lesson that it has yet to learn. IDF Spokesperson: We Made It All Up …Don’t We Always? Version One: Abu Rahmah died of an honor killing. Not confirmed. She wasn't even at the demonstration. Reported by hasbaritas after an IDF "press conference." No tear-gas inhalation. Version Three: Abu Rahmah died of health complications, coupled with poor treatment at the Palestinian hospital. She wasn't even at the demonstration. Certainly no tear-gas inhalation. Version Four – the current one - Abu Rahmah died after inhaling tear gas and after being given the wrong treatment at a Ramallah hospital. She actually was close enough at the demonstration to inhale tear gas and be rushed to a hospital for it. Why? The IDF doesn't say. No other illness, no leukemia, no contributory conditions. And the evidence for this all? Nada. Hearsay. Ye old crapola. What the IDF did was gather the Palestinian testimony that was published in the Israeli press – much of it couldn't be denied – and then concocted its own version of the events based on undisclosed sources. Nu, meila -- what will the old hasbarita, Elder of Ziyon, say – now that the IDF has contradicted itself and released a report based on unreleased testimony? Apparently, the shame and pathetic nature of it have caught up with him. I doubt he will be endorsing the latest version. He has some shred of intelligence. In fact, isn't it interesting that he has let this one quietly go. IDF: We have reason to believe that the death 2 days ago was because of another reason than what the Palestinians are claiming (tear gas inhalation). Facts: Abu Rahma's documented lab work is dated on Friday at 2:45 PM. Her admission time to the ER in the same Ramallah hospital was 3:20 PM. Hospital Lab work is usually done after you arrive at the hospital, not before you arrive. That is the entire medical basis for the family's allegations. We always see photos of rioters – yet this time, no photos appeared of this woman. Jeffrey Goldberg believes that the Jewish settlement in Sheikh Jarrah is "not necessarily" in the best Jewish self-interest. Why not? Because peace is important, and without a Palestinian East Jerusalem, there will be no Palestinian state, and hence, no possibility of peace. Israel will either cease to be a Jewish state (through the absorption of Arabs), or it will cease to be democratic. "It will not survive if it becomes a pariah state, and, in this unfortunate world in which we must exist, Israel is in danger of becoming an outcast among nations." For Goldberg, the ultimate and overriding moral injunction is to preserve the state of Israel. All other considerations, if they obtain at all in this "unfortunate world in which we must exist," are secondary. If the Judaization of East Jerusalem conformed to Jewish self-interest – didn't Jewish self-interest dictate the Judaization of the Arab neighborhoods of West Jerusalem? -- Goldberg would apparently see no problem. After all, "Jerusalem is Judaism's holiest city" and "Jews have a right to live wherever they want in the Land of Israel". As for the Shepherd Hotel, "in and of itself, it is not a morally profound issue"
It was bought legally by Jewish buyers years ago; it did not house Palestinians, and it is associated with the former Mufti of Jerusalem, Haj Amin al Husseini, who was an actual bona fide Nazi, so its disappearance does not cause me sorrow. The world's focus on Sheikh Jarrah is, of course, disproportionate in the larger scheme of thing. Goldberg does not say whether the removal of Palestinians from Sheikh Jarrah is a "morally profound" issue; perhaps, he thinks that it is. What is wrong with all this? In the end, Goldberg opposes the de-Arabification of East Jerusalem. What difference does it make how he reasons? Isn't he getting enough flak from his rightwing readers for his liberal-hawkish Zionist perspective. Shouldn't I be giving him a break? No, I shouldn't, for two reasons. First, Goldberg's account is factually incorrect and tendentious. Second, it lacks what is lacking in almost all the liberal hawkish/neocon writing on Israel: holding Israel to a reasonable moral standard besides that of the Mafia. First, the facts: Goldberg surely cannot be unaware that almost all of the "sales" of Arab property to Jews in East Jerusalem are at best legally and morally questionable, and at worst, bogus. Some properties have either been purchased by the state, often with secret funding funneled through groups like Ateret Kohanim, with the express purpose of Judaizing East Jerusalem and ridding it of its Arab heritage. This has been described in numerous books and articles (see, for example, Separate and Unequal: The Inside Story of Israeli Rule in East Jerusalem, pp. 216-218; the Ir Amim website should also be consulted.) Some of these sales have been judged bogus even by the Israeli Supreme Court. Most of the properties were transferred to Jewish owners on the basis of the Absentee Property Law of 1950, by which the state was allowed to take property of Arabs who left for, among other places, Jordan. In some cases, we have the absurd situation where property owners living in East Jerusalem, occupied by Jordan in 1948 and then by Israel in 1967, may have their title to ownership disputed because they "fled" to Jordan (i.e., East Jerusalem) in 1948. But even when this is not the case, the use of the Absentee Property Law is morally outrageous, even according to those liberal Zionists who justified its use in 1948. And how does the theft work? Settler groups try to find Arab homes whose owners are no longer there, have them registered with the custodian for absentee property, and then receive them from the government. This cooperation between settlers and government began in the late 80s and has continued ever since; since Nir Barkat was elected mayor of Jerusalem, it has become a national disgrace. The Judaization of East Jerusalem is not the story of conventional real estate transactions in an open city; rather, it is the story of government-sponsored ethnic cleansing of occupied territory in an attempt to erase the historical and physical presence of Arabs in East Jerusalem – sixty-three years after the government did the same thing in the Arab neighborhoods of West Jerusalem. Goldberg also must be aware that the Jewish ownership of both the Sheikh Jarrah properties and the Shepherd Hotel is disputed. In the former case, the owners have Ottoman documents that they claim show that the land was rented to, and not purchased by the Sephardic committee. But even if the Sephardic committee was the owner before 1948, it is morally outrageous to evict Arab families who were not allowed to return to their homes in W. Jerusalem, and who were sold these homes by the Jordanian authorities over forty years ago. They have now become refugees twice – both times because of the state of Israel not allowing them to return to their homes. If it is just to transfer the Sheikh Jarrah homes to rightwing Jewish extremists on the grounds that it was owned by Jews in 1948, why is it not just to transfer homes in Talbieh, Baka, and Katamon, to their original Arab owners? The injustice cries to high heaven, which is why leading intellectuals and people of conscience find their way to the weekly Sheikh Jarrah protests. And what of the Shepherd Hotel? Because nobody actually turned Palestinian residents into the streets, and because over sixty years ago it was associated with the Mufti of Jerusalem, Goldberg finds nothing morally problematic in a secret purchase by an American Jewish gambling mogul in order to eliminate the Arab presence in Jerusalem, and then tearing it down to put up Jewish apartments. (When was the last time Jewish property was torn down in Jerusalem in order to build housing for Palestinian residents of the city? When was the last time that any such housing was built?) He doesn't care that the hotel is claimed by the descendants of El-Husseini family and was questionably transferred – without any documentation, apparently -- to the custodian for absentee property? He doesn't care that another landmark of Arab Jerusalem is deliberately erased. He doesn't care that the final word on justice in Occupied Jerusalem (maybe not "occupied" according to Goldberg, but according to the rest of the world) is given to the Supreme Court of the Occupier, which can only judge according to laws that favor Jewish claims. None of these moral outrages bother him – what interests him is only Jewish self-interest. Jewish self-interest will no doubt allow Jewish tourists to sleep in the five star Palace Hotel now being renovated in West Jerusalem (after being seized by the Israelis in 1948), despite the fact that it was built and owned by the Mufti. In Jerusalem, Palestinians have suffered undeniable injustices for over sixty years, beginning with their expulsion from their homes in 1948, the subsequent theft of property and annexation (unrecognized by the world to this day), and ending with the annexation and Judaization of East Jerusalem, a process that only has accelerated in recent years. None of this matters to Israel supporters, unless it reduces the chance for peace. Is Israel's conduct in East Jerusalemt bad, or merely bad for peace? It is indeed bad for peace, but more importantly, it is just bad..
That's called Jewish morality, or just morality. As for the reliability of the witnesses, it has been proven time and time again that Palestinian witnesses are more reliable than the IDF, which is often backtracking and changing its story. Just two days ago there was a story of a Palestinian being shot dead because he was going to stab an Israeli. You can still find the headline on the web here. But click the link, and voila, the knife has been transformed into a broken bottler here. Hey, even a broken bottle can do damage, I suppose. Only it turns out that the bottle wasn't broken, as reported here. It turns out the guy was completely unarmed, and he happened to be carrying a bottle. What does the IDF say? "Oops. My bad; a few misunderstandings…"
An officer in the Central Command said the incident seemed to have been caused by "a combination of misunderstandings stemming from the Palestinian citizen's inexplicable behavior and the high state of alert of the soldiers" and that a thorough investigation was under way…. The newly appointed commander of the Jordan Valley Brigade, Col. Nohi Mandel, is investigating the incident, whose details are not yet clear. Some soldiers said Dragma had a knife on him, although it turned out to be a glass bottle. Dragma apparently does not belong to a terror group, nor did he suffer from a psychological disorder. In other words, first you shoot (Who believes the army's claim that the rules of engagement were observed? What? No hands are raised?) and then you cross your fingers and hope for the best. In the meantime, the IDF tries to control the story by putting out information that it later retracts. We know that there are IDF soldiers testimonies of soldiers firing at unarmed civilians, and, occasionally, one or two are caught and given slaps on the wrist. These are routinedly denied by the IDF, unless they are caught on film, or a soldier goes to testify, etc. Who besides the dead man will know about the cover-up? Anyway, the facts don't matter to the IDF, now that the "competing narratives" are out there. But for the record, here is the statement by Jonathan Pollak of the PCC of Bil'in. Now you know why he was arrested for riding a bicycle in an "unlawful assembly." The evidence surrounding the events leading to the death of Bil'in resident Jawaher Abu Rahmah disproves completely the army spokesperson's version, to the point of putting the army in a ridiculous light. The army's version is based on claims made anonymously, without any supporting evidence – unlike the version of the Abu Rahmah family and the Popular Coordinating Committee of Bil'in, which is detailed below. Since yesterday, the army has been promoting in the Israeli media a mendacious version regarding the events that led to the death of Jawaher Abu Rahmah of Bil'in on Friday, 31 December 2010. According to the army's version, Jawaher was not injured by tear gas and was possibly not even present at the demonstration. The army spokesperson did not see fit to publish an official statement on the matter, instead passing the information to the media in the name of anonymous "army sources." Soubhiya Abu Rahmah, mother of Jawaher: "I was standing beside Jawaher on the hill that is near the place where the demonstration took place, when we were injured by a cloud of tear gas. Jawaher began to feel unwell from inhaling the gas and started to move back from the place; soon after that she vomited and collapsed. We took her to the nearest road, and from there she was evacuated by ambulance to the hospital, where she remained until her death. She was not sick with cancer, nor did she have any other illness; and she was not asthmatic." Islam Abu Rahmah: "I was standing with Jawaher, her mother and my grandmother in order to watch the confrontation that was going on just in front of us, in the area of the fence. The wind moved the gas in our direction, making our eyes itch and tear up. After that she (Jawaher) began to cough and foam at the mouth. Soon after that she became weak and lay down on the ground. I succeeded in carrying her as far as the Abu Khamis home, about 40 meters in the direction of her house, but then she became terribly weak, vomited violently and foamed at the mouth. She was having difficult breathing and lost her sense of direction. We got a few women to help her by waving a paper fan over her face in order to provide some oxygen. After that she was taken to the hospital." The army has also claimed that the reports about Abu Rahmeh's injuries started to arrive only several hours after the incident, in the evening. That claim is contradicted by a tweet sent by the NGO Jewish Voices for Peace (JVP), which reports the injury of Jawaher, including her name, in real time (click here to view). The tweet was sent at 2:36 pm (4:36 am on the West Coast of the United States). Wafa, the Palestinian news service, published a report that includes the injury of Jawaher Abu Rahmah shortly after the event (click here to view). Also according to "army sources," which remain anonymous, Jawaher Abu Rahmah suffered from a serious illness, possibly leukemia; the "sources" postulate that she died from a pre-existing condition rather than tear gas inhalation. Several sources reject that claim. Dr. Uday Abu Nahlah: "Jawaher Abu Rahmah was employed in my home on a regular basis. On Thursday she was at work as usual, healthy, only one day before her death." Phone: 059-9796827 (English and Arabic). Jawaher had an inner ear infection, which affected her balance, for which she was recently given a CT scan. The radiologist who performed the CT scan, Dr. Hamis Al Sahfi'i, confirmed that the brain scan was normal (for the CT scan results click here). Jawaher had a minor health issue involving fluids in her inner ear. Her physicians insist that she did not suffer from any illness or from any symptoms that might, if combined with tear gas, lead to her death. Mohammed Aida, director of the Ramallah health center where Abu Rahmah received her care: "Jawaher Abu Rahmah died from lung failure that was caused by tear gas inhalation, leading to a heart attack. She arrived at the hospital only partly conscious, and then lost consciousness completely." Click here for the hospital's official medical report. Mohammed Khatib, a member of Bil'in's Popular Coordinating Committee: "The army is trying to evade its responsibility for Jawaher's death with lies and invented narratives that have no basis. They are spreading these lies and invented narratives via the media, which is not bothering to do basic fact checking. Our version is supported by named sources and with medical documents. In a properly functioning society, the army's version, which has been spread by anonymous sources, would not be considered worthy of publication." A female protester dies at a Bil'in protest from tear gas inhalation. The IDF is not only faced with a public relations nightmare, but also with the real possibility that there will be pressure to change its mode of operations, and to use a less effective (from its standpoint) tear gas. There may even be pressure to conduct a military investigation, which the IDF certainly doesn't want. So the only thing that it can do is to attack the credibility of the woman's family and witnesses. With the willing help of a rightwing blogosphere, they start the rumor mill and run with the "multiple accounts" trick that is the mother's milk of conspiracy theorists and bloggers. Jawahir Abu Rahmah wasn't even at the demonstration, wrote a friend of the family in a facebook post, she was at home 500 meters away. Even if that were true so what? The gas goes everywhere, and it may be more lethal indoors. But how do we really know she even died from gas inhalation? Rumors start to fly that she was pregnant and that this was an honour killing. 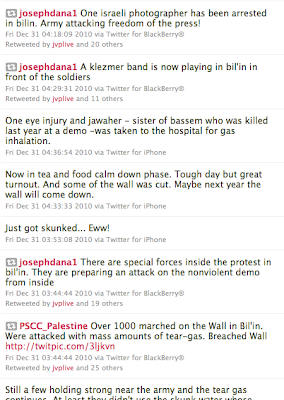 The IDF and the "responsible" rightwing blogosphere reports the libels as "unconfirmed" – but report them nonetheless. But – aw, crap – the PA then releases the medical report! So now the task is to use the medical report to try to discredit the testimony. She had been treated with doses of antibiotics – maybe that means she had leukemia. Ergo, she had cancer. Ergo, she died of cancer (by a remarkable coincidence, at the very time of the protest. ) And no postmortem was conducted; only the family's word was taken for it. And the body was buried on the same day. What are the Pals trying to hide? Why can't they be like Jews, who rarely conduct postmortems and bury their dead a long time after death? Fortunately, one newspaper, Haaretz, after printing on its website Anshil Pfeffer's report of the IDF "questions" (with Michael Sfard's rebuttal) updates the article with good reporting by Avi Issacharoff. And surprise, surprise – it does turn out that Abu Rahmeh had a medical condition – she had water in her ear, balance problems, all associated with local infections, which explains the antibiotics in the medical record.To be on the safe side, a physician had her get a CT scan – the medical document appears in the print Haaretz -- and the scan is normal. She sees a physician in a Ramallah hospital who tells her not to worry, and to see him in a month. According to a document obtained by Haaretz, Badwan prescribed a common remedy for dizziness and instructed her to bathe her ear in hot water. Samir said Badwan thought the problem was caused by water trapped in the middle ear, but nevertheless ordered a CT brain scan. Physicians consulted for this article said Badwan probably suspected another condition. After receiving normal results from the December 27 brain scan, Abu Rahmah saw Dr. Nasser al-Mualem at the Ramallah hospital, who according to Samir said her problem was common and told her to return in one month. The medical documents seem to support Samir's claim that with the exception of the headaches and dizziness, his sister was in generally good health. None of the doctors consulted for this article could think of a condition or symptoms that could be fatal in the presence of tear gas. Badwan – like my doctor, or any doctor – wanted to rule out something more serious, and so he acted like a good doctor and ordered a test. The test said things were ok. I hardly call that "suspecting another condition"; I call that "being on the safe side". We now have a ridiculous account out there of a woman who was not at a demonstration dying of cancer (or being stabbed by her family), and then being whisked to a hospital, buried suddenly, with documents not released for (mirabile dictu) two days -- and trumpeted by the hasbara-niks as "another example of Pallywood." Who cares about the facts when we are now are in a "battle of narratives"
And that is precisely what the IDF wanted. No investigation, for the moment. One eye injury and jawaher - sister of bassem who was killed last year at a demo -was taken to the hospital for gas inhalation. Remember Jawahir Abu Rahmeh, who was killed three days ago by the inhalation of tear gas at the Bil'in demonstration? According to the IDF, as being reported in the Israeli media, she may not have been at the demonstration, and she may not died of tear gas. It may have all been a hoax. Did Palestinians lie about death of Jawaher Abu-Rahma? Two days after reports that an anti-fence protestor died after inhaling tear gas fired by IDF troops, the army says medical information handed over to Israel raises fundamental question marks about the story. Note that the IDF does not conclude that Abu Rahma was not there. 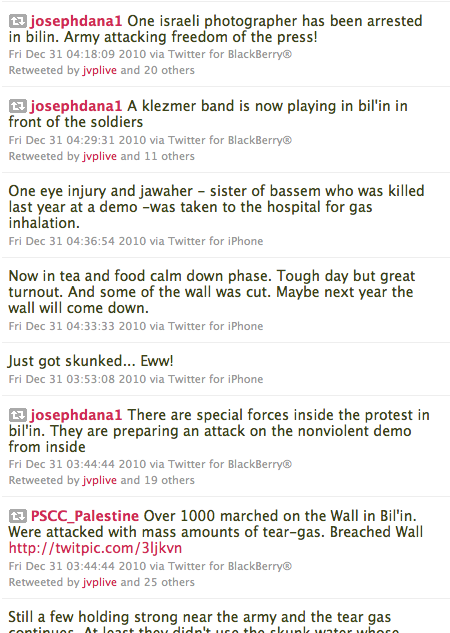 Note that the IDF does not claim that she did not die from gas inhalation. Note that the IDF has no evidence refuting the testimony of the family. Instead, the IDF "raises question," "points out 'contradictions' in the medical data" suggests that there is on evidence that she was there, claims to have gone over (tens of thousands?) of photographs of demonstrations and not being able to find her. The information also reveals that Abu-Rahma was administered an unusual quantity of drugs, used to offer treatment against poisoning, drug overdose, or leukemia. Moreover, her family's report that she was "hurt by Israeli gas" was not corroborated by any other source. Since the medical report has not been published, I don't know whether it actually said, "there was no clear cause of death." But it did report – and why shouldn't it – the claims of the family. And why would there be any reason to doubt them? As for no post-mortem and accelerated burial procedure – what religious Jew is unfamiliar with that. What cause was there for a post-mortem examination? As for the drug claim – that is not worth responding to. Who is making the claim? What is considered an unusual quantity of drugs? Who determines what the drug is for? Who the hell is behind all this crap? Even an idiot can see that the IDF is using the same "methodology" that Holocaust deniers use to raise questions about the number of Jews killed, or the presence of gas chambers to kill Jews, etc. That methodology is to "raise questions," to "point out contradictions", to suggest that the evidence is not convincing, to insinuate that those who make the claims are not to be trusted. We know this woman visited the same hospital 10 days ago and many other times in the past month. When we looked at the medication she was taking – it was for cancer. Whoaa! Nowhere does the IDF "source" actually say that Abu Rahmeh had cancer, or that a doctor had diagnosed her for cancer, or that people with cancer cannot die from, say, being run over by a car or tear gas inhalation. I know lots of people with cancer – apparently that makes them superman. The point is, dear reader, that the IDF is desperately trying to grab the narrative, the same way it tried to do in Gaza – and failed – and with the Mavi Marmara – and failed. The lawyer representing the Abu Rahma family completely denied the IDF's claims. Lawyer Michael Sfrad said that Abu Rahma went in for testing a week ago for a routine winter illness. "According to people I spoke with, [Abu Rahma] was at the demonstration on Friday but not at the forefront of the protesters," he said. "After she was injured by the tear gas, she was taken to the village and then transferred to an ambulance. An operational investigation cannot produce reliable findings; therefore we demand a criminal investigation by the military police." Let's hope somebody in the IDF is listening to Sfard. Incroyable! Israeli Protesters Who “Returned” Empty US Tear Gas Canisters Used At Bil’in to the US Ambassador – Are Being Held on Illegal Possession of Weapons! Israeli activists protesting the killing of Bil'in's Jawaher Abu Rahmah 'returned' spent tear gas canisters to the residence of the American ambassador to Israel late Saturday evening. Jawaher Abu Rahmah, 36, was evacuated to the Ramallah hospital on Friday after inhaling massive amounts of tear-gas during the weekly protest in Bil'in, and died of poisoning Saturday morning. The tear gas used by the Israeli forces in Bil'in is manufactured by Combined Systems Inc.; a United States company based in Jamestown, Pennsylvania. This is the first protest where empty tear gas canisters have been returned to an ambassador's home. Approximately 25 five Israeli protesters gathered in front of the residence of U.S. Ambassador to Israel, James B. Cunningham, around 1am local time. The protesters 'returned' loads of spent tear gas canisters collected in the West Bank village of Bil'in. The demonstrators also made noise throughout the ambassador's neighborhood, informing residents of how American military aid to Israel is being used to kill unarmed and nonviolent demonstrators in the West Bank. They chanted, "one, two, three, four stop the occupation stop the war. Five, six, seven, eight end the funding (US) end the hate." This action is one of the first by Israeli activists demanding accountability of a foreign government. Instead of targeting the Israeli public, activists did a symbolic action aimed at the United States. This could signal the future of targeted BDS-style actions (Boycott, Divestment and Sanction) actions by Israeli who witness the destruction of US military aid in the West Bank. Five demonstrators were arrested in the action and are currently being held in detention. It is unclear when they will be released and on what charges. The action in front of the ambassador's residence completed a day of protest throughout Israel and the West Bank stemming from Abu Rahmah's death. On Saturday evening,hundreds demonstrated opposite the Defense Ministry in Tel Aviv. Protesters managed to block Kaplan street, a main artery, for over one hour. Eight people were arrested, including a former Knesset member from the left wing Meretz Party, Mossi Raz. UPDATE: Nine activists were arrested in total last night. They are being brought before a judge right now on suspicion of possession of firearms (related to used means of crowd disperse found at the scene). The police have told the activists that they intend to extent their arrest. More updates to follow.